Brilliant by day, the white flower garden is even better by night. My own exposure began one moonlight night when I ventured out and found the common alyssum casting a psychedelic glow in the romantic light of a full moon. The Mogul Emperor Jahan constructed such a site in his Moonlight Garden in the sixteen hundreds.. It like the most famous modern-day garden at Sissinghurst was planted with pale flowers such as narcissus, jasmine and lilies. 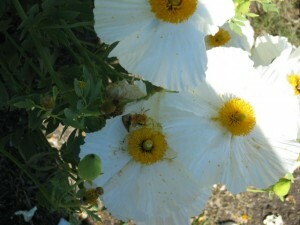 Fragrance was always part of the white garden as many white flowers give their fragrances at night. Their perfume bind to night flying moths and we humans take benefit from this encounter. Long ago I wrote a botanical description about a plant that I think is simply beyond intoxicating. 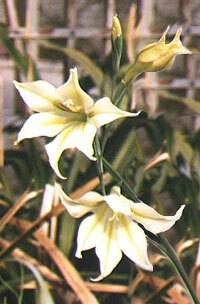 The plant was Gladiolus tristus, the receivee was not. playing to nature’s restless breezes. Maybe they aren’t easy and need courtly care. They can, however, given proper nurturing become sassy boisterous clumps and their fragrance simply overwhelming. Even one blossom, even one night is an inspiration. This is a flower one has to work for! The colors we surround ourselves with might say allot about ourselves, but in the front garden, airs are often put on. The result in a publicly viewed garden is that the colors we choose say less about ourselves, and more about what we want people to think about us. The romantic fragrant moonlight garden is none of the above. 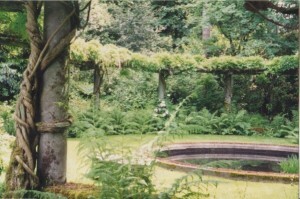 It is a garden to be built for romantic couple that lives within. A garden that is exotic — well jasmined and glows not only to the moon, but also for the couple that glows to the moon. I often wish that I lived in a warmer clime, as the mystical fragrances of some of these plants are a bit lost in our cold maritime air. Night parties that could enjoy the heady fragrances of such creatures as G.’tristus’ or honeysuckle, roses, lilies, datura and other plants are somewhat lost when we need to wear skullcaps to enjoy them. The stars however, do remain and perhaps some modern-day gardeners (and relationships) might benefit from a nocturnal stroll down the development of their own moonlight garden. The most famous modern-day garden can be found at Sissinghurst Castle in England. It was built by the poet Vita Sackville-West and her husband Sir Harold Nicholson. As to the ethereal beauty of the white garden she wrote: The ice-green shades that it can take on in certain lights, by twilight or moonlight, perhaps by moonlight especially, make a dream of a garden, an unreal vision.” Night brings magic as well as spirits, luminescent and glowing like the flower of the Saguaro in the desert, it creates a magic moment … the magic of a ghostly, glowing garden that encompasses form, contrast, fragrance and beauty. These luminous plants can include the exotic as well as the plain; all it takes is the planting and the visitation under the full moon. I include a few suggestions that you might consider in the inclusion of such a garden. Many of the Magnolia species, as well as the terribly overlooked Cladastris kentukea. A hardy tall-growing tree of beautiful foliage and wonderfully pendulous white flower panicles that are fragrant. The same goes with the white flowered Wisteria, be they W. floribunda ‘Longissima Alba‘ or the lesser known W.sinensis forms. Add to these gazebos trussed with Jasminum officiale, the poet’s jasmine or roses such as ‘Iceberg’ rich with honey-like scent that will beckon you from several feet away. Shrubs could include the variegated forms of Osmanthus h. ‘Varegatus’ or the incomparable workhorse Chrysanthemum hosmariense silver foliage and white chrysanthemum flowers from spring’s frosty dusk to fall’s first frost. I would also add Daphne odora ‘Alba’, and the white-flowering quince ‘Snow’ and ‘Candida’. More heat tolerant shrubs (and tender) would include Oleander, rose-of sharon, a white flowered rosemary, Halmiocistus wintonensis, Datura and Matiliya poppy – Romneya coulteri. Perennials not to be overlooked would include mats of Cerastium tomentosum, Lamium ‘White Nancy’, Achillea clavennae, Artemesia versicolor ‘Seafoam’, Helichrysum italicum dwf., Heuchera ‘Snow Angel’, Raoulia australis, Santolina incana, Tanacetum haradjani. There are also silver leaved Verbascum’s with yellow flowers and Senecio’s with the same. Aster’s and Boltonia include many white flowered forms as does Gaura lindheimeri. I also find that the inclusion of blue foliaged plants such as festuca or Helictotrichon (Blue oat grass) does little to detract from the white. In addition to my Gladiolus tristus, Leucojum and Narcissus bring an early spring color to the forum. So do some early Alliums and Easter lilies. Calla Lilies, and Oriental/Asiatic Lilies such as ‘Casablanca’ add to the summer show. All in all, although I no longer have a white garden, I did enjoy the one I had. As some suggest their own preference is for form or texture over color. I find the elemental shades of black and white a fascinating one. Photographing one’s garden in black and white is always an interesting study. Capturing the luminescence of a moonlit garden is a special delight!